You can’t raise Monarchs without the Milkweed family of plants. It is the sole Monarch caterpillar food source. There are over 100 species of milkweed in North America. They are members of the genus Asclepias. The thick, white milk (sap) of the milkweed family of plants contains lethal cardenolides (heart poisons). They produce vomiting and sometimes death if eaten by a predator. The Monarch’s tissues are miraculously not harmed by the chemicals which normally effect the nervous system. The Monarch’s total dependency on milkweed also means “no milkweed......no Monarch”. 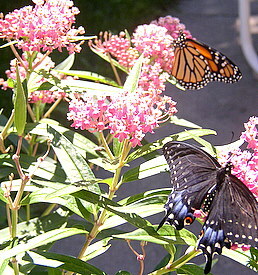 When I first decided to plant a butterfly garden, I read that you needed milkweed to attract Monarch butterflies. So...I planted some Common Milkweed. BIG MISTAKE!! This is an invasive plant that sends runners underground and shows up all over the place. It can look quite "weedy", also. Years later, I am still occasionally pulling this pest out of my garden. 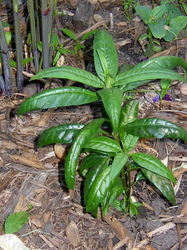 To the right is a photo of a mature Common Milkweed plant. Common Milkweed works fine for raising butterflies with kids (or yourself!) when you don't have any milkweed in your garden. It is usually easy to find in roadside ditches or weedy areas. Check out the leaves for eggs or caterpillars to bring home and raise. Don't forget that you will need a supply of leaves to feed the caterpillar. After realizing my mistake of planting common milkweed in my garden, I did some research and bought some perennial Swamp Milkweed. This is a nice garden perennial and its flowers are a favorite nectar source for many butterflies. My other favorite milkweed is Tropical or Scarlet Milkweed. This is an annual in the colder climates. I start Tropical or Scarlet Milkweed from seed (check out my easy directions on the link above) and put plenty of plants in my garden. This perennial milkweed plant is another popular plant that attracts monarch butterflies. 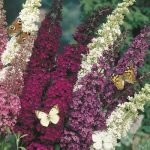 Check out more detailed information on these butterfly garden plants. Photos of Milkweed....my two favorites in the Milkweed family of plants. 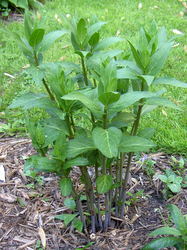 I also have seeds available for these Monarch Butterfly plants. 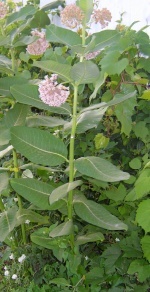 Click on the names below for more detailed information on these two varieties of milkweed. Purchase Tropical Milkweed Seeds....these are very easy to grow from seed and are definately the Monarch Butterfly's favorite host food! I have discovered as long as I have a good supply of the milkweed family of plants in my garden....the Monarchs will come!! I go into further detail on my two favorites from the milkweed family of plants in the links above, including more photos of milkweed.